Looking for some personal attention? Bridget and Melanie now offer private teaching and mentoring classes on Sundays, Mondays or after hours during the week. Whether you want to hone up on a few skills, have a couple of projects you really want to immerse yourself in, or just like the idea of that personal touch when it comes to learning, we can help. 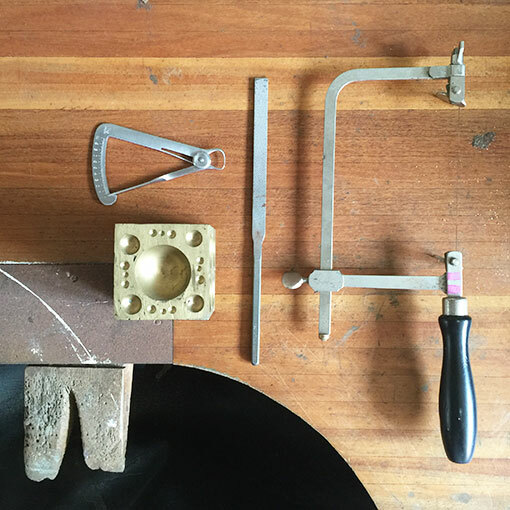 We also offer one on one mentoring for emerging jewellery artists who’d like some guidance on developing a collection, approaching galleries or managing their creative practice. Pop over to the online shop to grab a few hours, and we’ll call you to tee up a time. Or alternatively, give us a call at the gallery on 02 9698 7999 to find out more. The people who are close to Bridget know she HATES to throw things out unnecessarily. No, she’s not a hoarder, just someone who respects resources and hates waste! As a result, she’s decided to hold a series of short workshops teaching people the skills to repair, re-use, re-design, re-create existing jewels to bring them back to life. This festive season we’re here to make your life easier! Our gift certificates can be purchased online and posted directly to your loved ones. 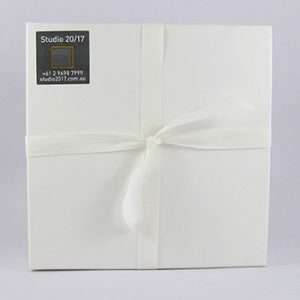 The certificates come packaged in a box with a crisp white ribbon and if needed can be sent directly to your loved ones. 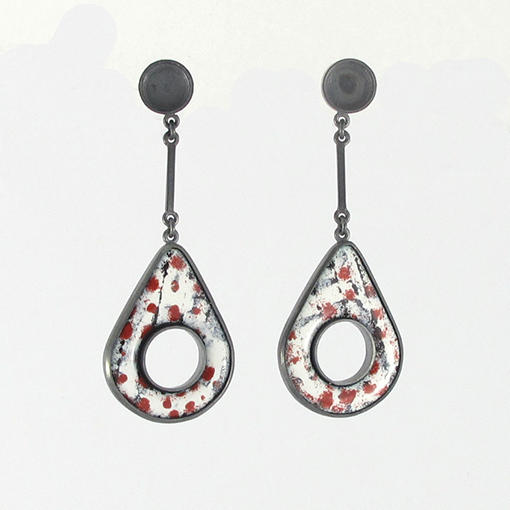 Joanna Harris MacNeil is an established jewellery designer who works extensively with enamel. 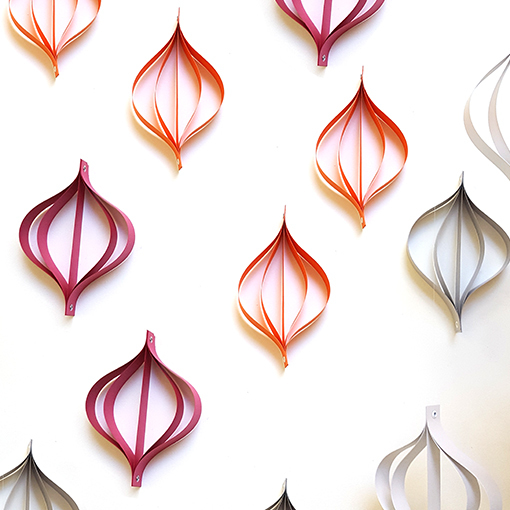 We interviewed Joanna to find out a bit more about her practice and what inspires her designs. 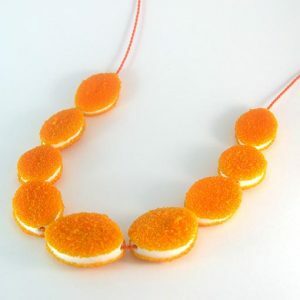 What led you to start making jewellery? I was living in London about to start a Phd in Genetics when, with 6 months to wait I did a gemology course with Gem A in the UK. 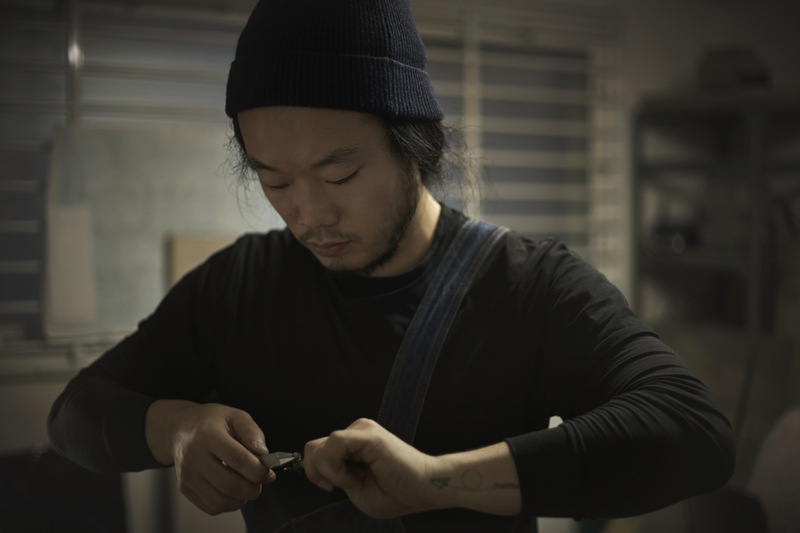 I met jewellers, they invited me into their studios and recommended a jewellery making course. I was hooked. What has been your educational path? Science mostly for years but in 2008/9 I did a Diploma in jewellery at London Metropolitan University, following that a 2 year Diploma at NMIT in Melbourne and currently I am ¾ of the way through a Masters in Visual Art (Gold and Silversmithing) at ANU. Do you derive your inspiration from a particular source? My eyes, my hands, the process of enamelling and fabrication and the part of the world that I inhabit at the time of making. All of the above at different times but I do find that a little time spent really looking at the world around me stimulates ideas. I often start with a drawing and if it’s a really new design I make a model to see how it all fits together. 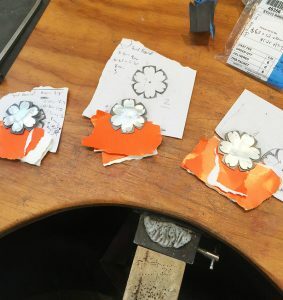 What led you to the technique of enamelling? While I was studying in London I was lucky enough to be taught by Joan MacKarrel. I’ve been experimenting ever since. What brand of enamels do you use? I use Thomson lead free enamels when I use opaques. Barbara Ryman recently introduced me to Japanese Ninomya transparents. Could you tell us more about the techniques you use in enamelling? I mainly work with opaque enamels. If I sift enamels I build up layers and grind them back until I achieve the result that I want. If I paint with enamel I use a variety of brushes, pencils and quill pens to draw on the enamel surface. 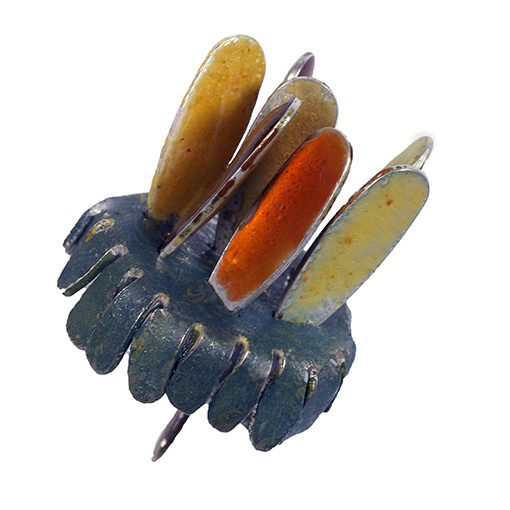 You employ a limited colour palette in your enamelled pieces, why do you choose these colours? The body of work that I have was inspired by a visit to the grave of my Great Grandfather in France. I was surprised by my emotional response to this and as a result created enamel pieces that are intended to evoke poppies, trenches and simple hand stitching. There is a hole, a piece missing from each item that I make, this represents for me the effect that the death of my Grandfather had on my family for generations. How has your work evolved since you began? I began making flowers and setting stones. My idea of jewellery has broadened significantly since then and my work is more geometric and a bit abstract. Having said that I do paint flowers sometimes. Has chance ever played a role in your work? What is your studio like? Do you work alone or share a space? My studio is in a semi-converted double garage at home. I work alone. I find it hard to concentrate when other people are about, they are always doing interesting things that distract me. Which jewellery artists do you admire and why? 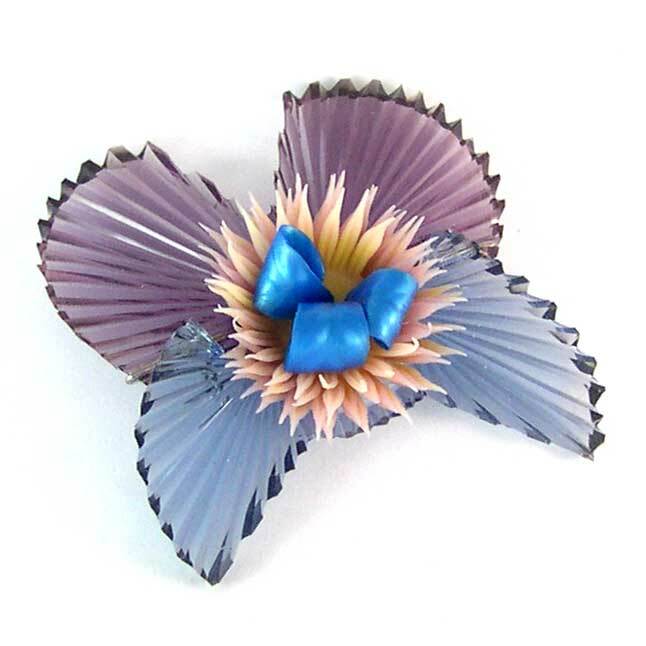 Jessica Turrell is a truly experimental British enamel artist whose work I have always admired. Barbara Ryman is an Australian enamel artist, also with an experimental bent, whose work, love of learning and willingness to share knowledge is inspiring. What are you planning to explore in future work? 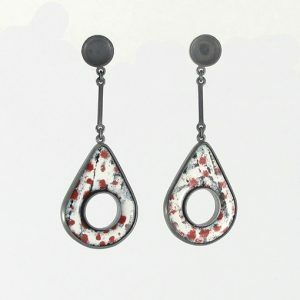 I would love to make my own enamels. This would appeal to both the scientist and the enamellist in me. Wednesday 23rd – 26th September – is our ONE WEEK ONLY studio bench clearance! We don’t believe in sales (we value our artists and their work too highly for that) but we do believe in making way for fresh ideas! So, for ONE WEEK ONLY, Bridget, Jenny and Mel are clearing their benches, emptying their drawers and holding a WORKSHOP CLEARANCE! We’re getting rid of prototypes, older collections of work, one-off pieces, strands of beads, jewellery magazines, books and maybe a few jewellery tools, all at heavily reduced prices! We also have a beautiful strand of diamonds available to be made up for someone looking for an extra special bespoke gift. 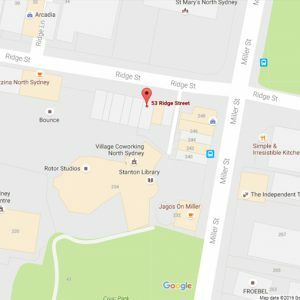 Doors open 11am Wednesday – get in quick! Looking for something special this Father’s Day? 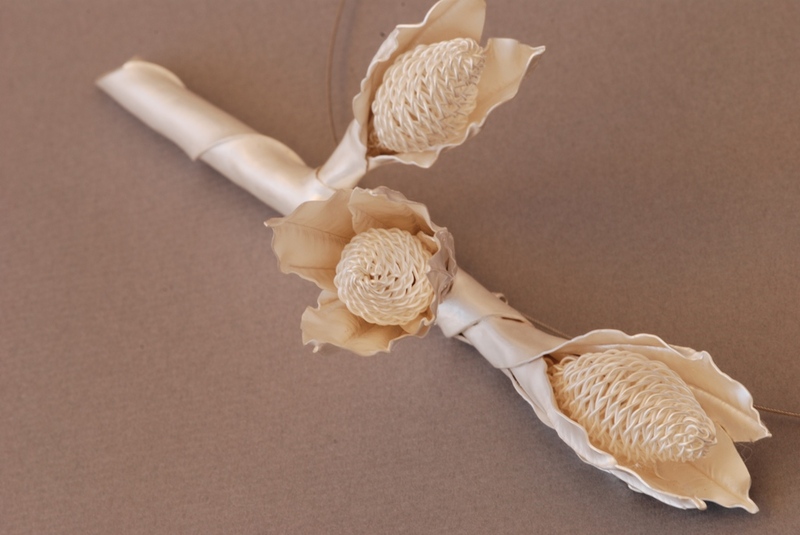 Fathers’ day is September 6 – pop in to the gallery or check out our range of artisan made gift ideas online. and winner of ‘Profile ’15 – Established Artist Award’ for her two neckpieces It’s as simple as…white and It’s as simple as…black. 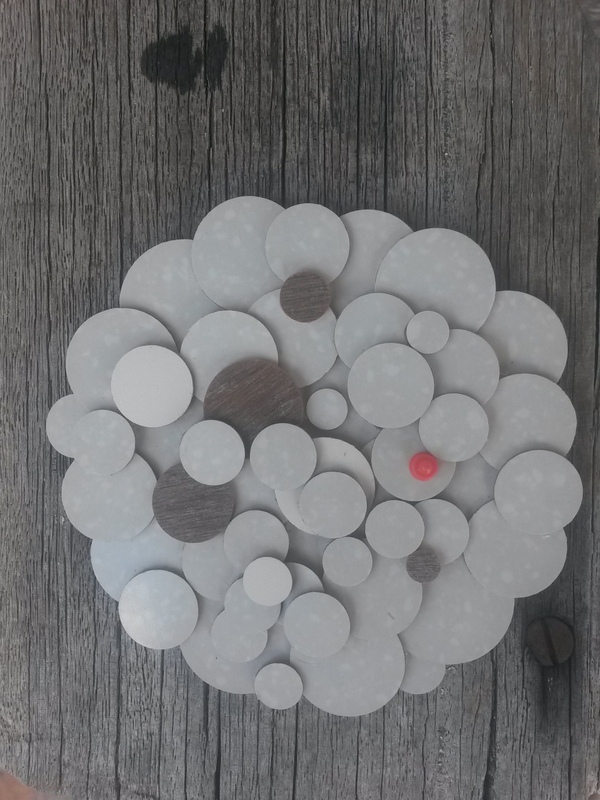 The works are on display at Airspace Projects, Marrickville until 25th July 2015. 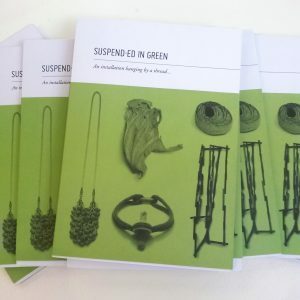 We’re getting pretty excited about our next exhibition, Suspended in Green, opening on 8th July. If you want to have a sneak peek, we have a limited number of 10 catalogues available for sale in the gallery…although seeing jewels ‘in the real’ is always sooo much better! 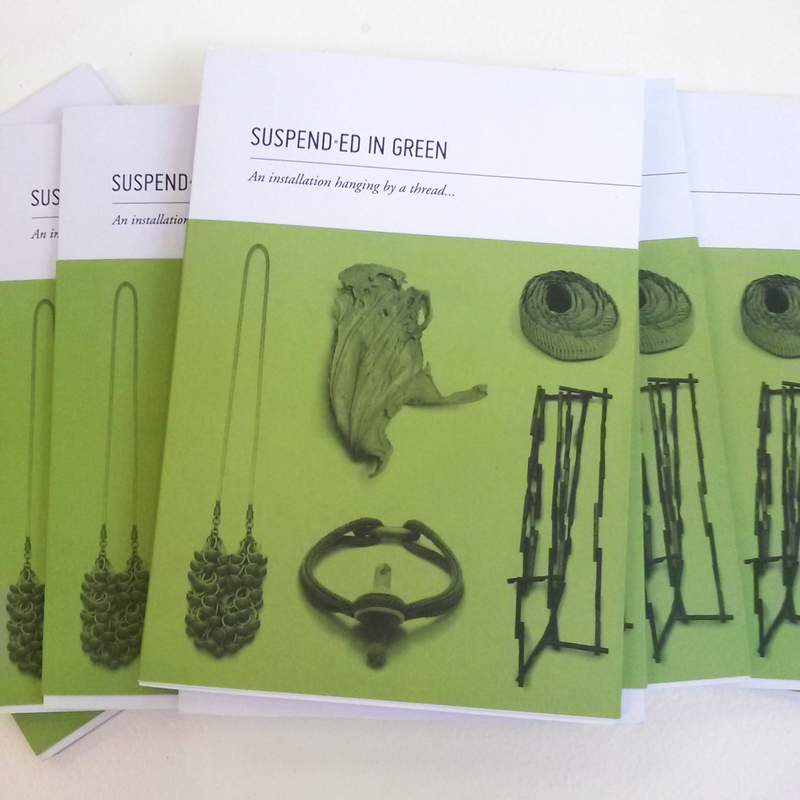 Suspended in Green – $35, Suspended in Pink – $55. Call us now at the gallery on +61 2 9698 7999 to reserve yours! I recently finished an 18ct gold ‘weave’ bangle for a client last week. She wanted an extra special ‘heirloom’ piece of jewellery to give to her granddaughter on her 18th birthday. She brought in old jewellery that have been lying around in her jewellery box for decades. Broken and missing earrings, jewellery she had inherited but had never worn due to a difference in taste and jewellery that she was tired of. I melted down all these bits into small ingots, then rolled and drew down the metal to very thin wire to create a new heirloom for her 18 year old granddaughter. It was a great way to use up all that precious metal to create a new, loved piece of jewellery. This is the sort of jewellery I just LOVE to make! ps. The granddaughter loved it! A great tool to help us all show our love in a way that they will just GET it! We’ve had some gorgeous men into the gallery in recent times. One romantic soul is having a ring made by us for a surprise proposal to his girlfriend, another came with his partner and made a special gift together and for another we melted down gold that he’d collected with his mother while gold panning as a child. 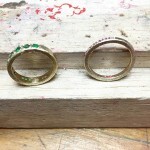 We made this into a pair of custom designed earrings and a ring for his lucky mum. What a fabulous gesture of love symbolising so many treasured childhood memories…….anyway, these guys got me thinking. I love having gifts for very special occasions as they embody special memories that last and can totally relate to the gesture these guys were making. When a Birthday or special occasion comes around, my kids always ask me what I’d like as a gift. They desperately want to buy me something. To be honest I do love the handmade cards they make for me and just about anything handmade I’ll appreciate because of the time that’s been invested in making but would be happy if the kids just gave me a huge hug and tidied up their rooms without me asking! Okay, I totally get that my kids just want a way to show me their love and I do want to honour that. I think that’s the same for all of us. Some of us love to feel special by receiving a random bunch of flowers or special present, or feel loved when spending quality time at a workshop, learning something new with a special friend. For others, it might be coming home and finding that your partner has thoughtfully arranged to get your shoes repaired, for others it may be getting heaps and heaps of hugs or just being told how great you are! Anyway I just have to share something cool which I’ve recently found out. It turns out there are 5 DIFFERENT LANGUAGES OF LOVE and when you know which one your loved one recognises, you’ll be able to REALLY show your love in a way that they’ll just GET IT! It could be Words of Affirmation, Physical Affection, Acts of Service, Gift Giving or Quality Time. 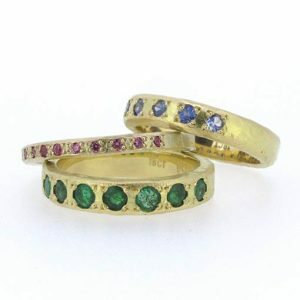 Mine is Acts of Service….which may be why one of the things I enjoy so much here at the gallery is repairing broken jewellery for people or resurrecting heirloom jewels into contemporary new designs. I’d love to hear what your love language is! We are looking forward to receiving new work for the show ‘Lamina’ into the gallery. Kath Inglis is well known for her distinctive style and signature use of the material, polyvinyl chloride (PVC), a material that is sourced by Inglis as a clear flexible sheet and is manipulated by colouring, cutting, carving and more recently, heat fusing layers. how it can influence or inform the subsequent structure of the rock. sometimes the bones of the past seem to protrude through a thin modern veil. Inglis says “Light is a significant material in my work and I have attempted to ´lace with light´ by heat fusing two layers of intricately hand cut PVC together. The interaction of light between the layers glitters like super-charged cut crystal vase”. A selection of works from the exhibition. Please contact the gallery for information on pricing and further details. Just back from my Artist Residency! Over a year ago I received news that the application for my month long residency at Hill End had been successful. This bit of gold on the horizon promised to be a wonderful start to 2015. 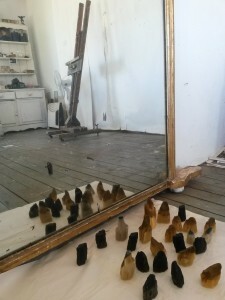 The artist in residence program is managed by Bathurst Regional Gallery and provides an opportunity for creative development in the unique environment of Hill End and its surrounds. There are two residences available, Murrays Cottage, where Donald Friend used to live, and Haefligers Cottage, which once belonged to the artist Jean Bellete and her husband Paul Haefliger. I stayed at Haefligers, a small wattle and daub building with a detached studio. The contents of the house comprise mainly of the original furniture and belongings of the Haefligers. The time spent there was memorable in many ways. What stands out, upon reflection, is solitude, space, silence and uninterrupted time – a rarity in busy Sydney, with two kids and two businesses on the go. The opportunity to spend whole days not talking to anyone, not thinking about anything but my own practice, or whatever I wanted to think about, was an incredible gift. There was no television, very little lighting at night and a heavenly silence. With a population of only 75, when I first arrived I felt like an interloper, acutely aware I was the new stranger in town. I found myself going for a walk at dawn and dusk and spending much time in the studio exploring ideas that had been simmering in the back of my mind for a while. My walks provided me with freshly picked berries, figs, apples, pears and tiny sweet plums. During my time there the remaining plums on the trees dried and shrivelled in the summer heat. At the time, this reminded me of how important it is to grab the moment and opportunities when they arise, to embrace them, as they too can shrivel and die unless given the chance for fruition. It was quiet. The silence enabled me to hear the bees buzzing loudly in the clover when I took my early morning walks. Or maybe it was that my mind also had time to quieten and become more open to sounds that are normally drowned out by both internal and external noise. The land has a rich and layered history beyond its natural rural evolution and the historical human intervention in the earth fascinated me. As I walked, I was acutely aware of the ground beneath me – how it had been heaved, smashed and churned over. There are pits and potholes of old mines scattered throughout what, in some areas, looks like a moonscape. Hill End is an historic gold mining town and at one time it was a bustling, crazy melee of thousands of people turning over every inch of soil looking for the gold that would change their lives. Some say there is more gold still in Hill End than was removed from it and on weekends the roads become (slightly more) busy with 4WD vehicles filled with optimistic tourists keen to fossick for gold just outside of the historic town. Previously plots of land were marked out, tightly held and disputed, but now those boundaries are left to decay. Fallen fences are a reminder of history and the passage of time. The remaining buildings have a weathered patina with the colourful and subtle palette that only time can bring. In the last half century, many artists have made Hill End their home and in the quiet of the street, as I walked, there was an awareness of much happening behind closed doors. The time spent there was simple and grounding. I was able to spend time with myself without the pressures of external schedules or the expectations of other people. It seemed to help me find my natural rhythm and I found I wanted to walk more, make more, eat less. I woke refreshed each morning. I had no urge to relax at the end of the day with a glass of wine, or reward myself with a hit of sugar. It just seemed unnecessary. Whilst in my practice in Sydney I appreciate input and collaboration, my experience at Hill End led me to consider that there is a need for the space that solitude provides and where thoughts can meander and solidify. I took to the residency a number of projects that I was already working on (I like to keep my hands busy) but I had no expectations nor pressing need to finish any. I worked on simple pleasures like crocheting a bag and a series of colour studies from recycled materials, using the rich and lush colours in the local environment from which to draw inspiration. I felt drawn to the many broken rocks that form the landscape, and spent time walking and collecting these as well as materials like bags of kangaroo poo and coloured soils. I started another wax work of multiples and rediscovered a childhood love of clay. The projects were varied and the mental and physical space allowed me to spread out. The residency left me refreshed, full of new ideas that I will meander through with time, along with insights and developments to enhance my existing practice. In the coming months, the olives and quinces in the garden will be ready for the next lucky artist residents. Images from that time can be found on Instagram by following @bkandco hashtag #hillendiamusings. Enjoying the colourful and joyful work by Alice Potter in Colour: Speaking in Plumes currently in the gallery. On until March 21. 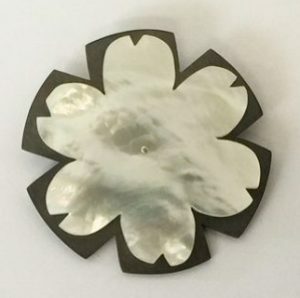 Karin Findeis, Brooch ignota flavum viriditas mordens (Parisiis I), sterling silver, enamel, fine silver, wax. We’ve fiddled with our website…. Mel and I have changed our wordpress theme and made a few little changes. We hope you like it. Please feel free to give us some constructive input on what’s working for you, and what isn’t and we’ll do our best to work out how to change it! We’re uploading more to items to the SHOP page regularly so you can now buy selected work by our fabulous artists online. Bark, Leaf, Bud exhibition is now showing. We have just finished installing this quietly beautiful exhibition of formed bowls, objects and jewellery by Mitsue Slattery. 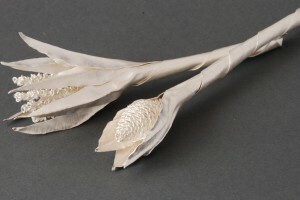 Primarily fabricated from fine silver, Mitsue has used weaving and raising techniques to create these delicate yet strong works. We’re pretty excited! 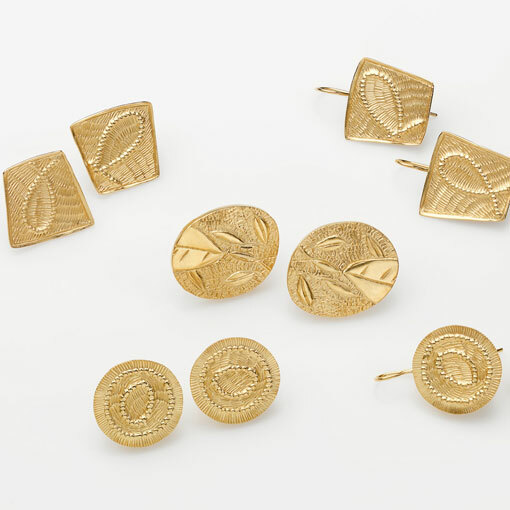 Julie Blyfield has recently started stocking with us and we have just received a limited number of her beautiful earrings into the gallery including the gold plated sterling silver earrings below. The 2 Danks Street Award for Contemporary Art Criticism has been established by the permanent galleries of 2 Danks Street Waterloo to foster new writing on, and extend discussion about, the visual arts. This award is initially being given for writing about exhibitions at galleries in the 2 Danks Street complex. In subsequent years, the intention is to extend the award to exhibitions in other Sydney based commercial or private contemporary art galleries. We turned 5 in early February and Melanie and I have been so busy, that we totally missed it (but we’ll still happily accept birthday presents)! As we look forward to yet another fabulous exhibition opening in the gallery today, I thought it was time to take a few minutes and reflect on the last five years and where we’ve come from. We’re usually caught up in doing our best to make the gallery and our client’s experience (both artists and retail customers) better, that we sometimes forget how much we’ve achieved. – had a baby (well, Melanie has)! – and have managed to survive the GFC (please, we don’t want to hear that word again) and are looking forward to a great year ahead. We’ve been blessed to have the wonderful support of many contemporary jewellery artists and collectors, and the mentorship of some very special people (you know who you are) over the last 5 years. Without this support we just wouldn’t be here. We’re very excited about 2013 and privileged to be exhibiting artists of the calibre of Melinda Young, Sean O’Connell and Julie Blyfield this year….just to name a few! We installed a brand new internally lit cabinet in the retail section of the gallery towards the end of last year and are looking at launching a studio wedding range later this year. We love walking down the corridor of 2Danks in the morning and every day we feel privileged to open the doors of our gallery and continue our role in supporting and increasing the profile of contemporary jewellery. We’re often asked by students and emerging jewellers for hints on how to establish a relationship with a gallery – and keep it! So here’s a few little snippets of info that we’ve found useful for ourselves as both practitioners, and gallery directors. Running a contemporary jewellery gallery is challenging and not particularly financially rewarding..and we’re continually making mistakes and learning….but we all know that none of us are in the arts for the dollars….and if we wanted to make a half decent living, we’d be selling Pandora beads and not beautiful, challenging, exciting Contemporary Jewellery. 1. Deliver work on time for exhibitions. While it may be cool to be fashionably late to a party, this is definitely not the case for your work at an exhibition. It’s stating the obvious but a lot of time and effort goes into putting on a show, and when there’s been deadlines given, and plenty of leeway, the excuse, of ‘sorry, I’ve been busy” is one sure way never to be invited to participate again….hey, we’re ALL busy! It’s disrespectful to the other artists and the gallery and effects the integrity of the exhibition. 2. Make life easier for the gallery that represents you, not harder – by providing consignment notes at the same time that you provide us with your work. Galleries have to spend a large amount of time on administration of work. The more artists, the more work. If we have to do YOUR paperwork as well as OURS, it just doesn’t work. If we have to chase you up on it, it just doesn’t work. Make sure each item in the consignment clearly identifies which piece it relates to. Your work cannot be shown to clients unless we know how much to sell it for and details of materials, processes etc. By providing a consignment note with your work, you show us that you’re not only a fabulous artist but that you’re also professional. 3. Invest in good quality/professional images of your work. Galleries are always needing images for publicity as well as for use on websites, blogs and invitations. It’s in your best interest to supply quality images (with correct photographer credits and image details) as your name will be beside the image promoting not only the gallery but you the artist as well. While we do make every effort to photograph work, fantastic images supplied by artists will take priority as they’ve made our job of promoting them so much easier! Please, no black, blue and textured backgrounds! Poor images of your works aren’t worth sending. Simple white is the general rule when dealing with galleries, publicists and magazines. If your photography skills aren’t crash hot, invest in some professional shots. A wise friend once told me that you can get years of value and mileage from just one or two great shots. 4. OWN your work – by this I mean take pride in your work out there in the universe, repair any defects in your work free of charge and as a priority. 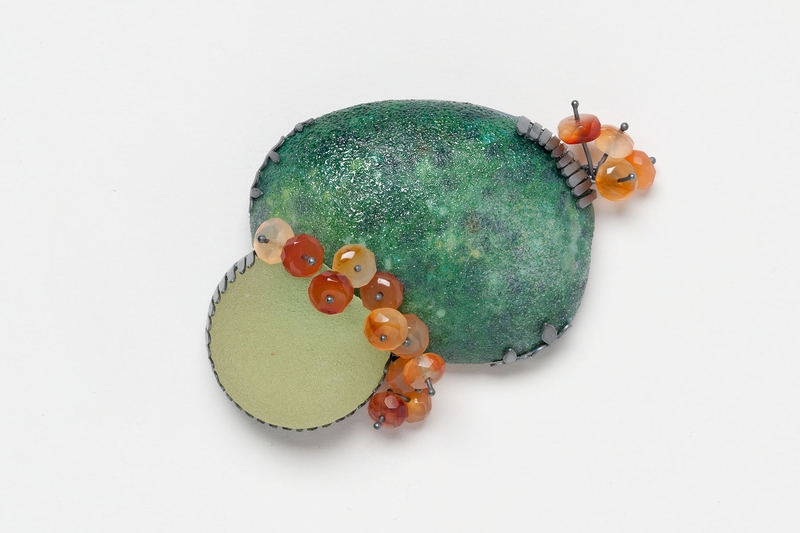 We’re not talking the usual wear and tear here, but rather situations like ‘the brooch finding doesn’t work – it keeps falling off’, or ‘it just fell apart – I only wore it a few times’. While none of us like to be out of pocket for our precious time and materials, the reality is, if we’ve made something poorly – this is the consequence. Remember, the gallery’s reputation has been effected by selling the item to a valuable client, the client’s time has been effected by having to deal with the return of the piece, and there have been financial outlays by the gallery – the time spent placating a client, the correspondence entered into with the artist, the costs of return postage. We expect artists to guarantee their work for an absolute minimum of 6 months, although many of our artists offer a lifetime guarantee on any defects. 5. 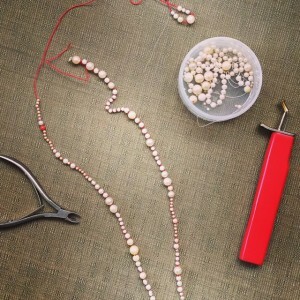 Beading/threading/stringing – call it what you want – just make sure its done right and tight. Yes, after time some neckpieces may need a retread, we tell our clients this, just like a pearl necklace, there may be a maintenance cost sometime in the future. However, it’s important to have the work threaded properly in the first place. 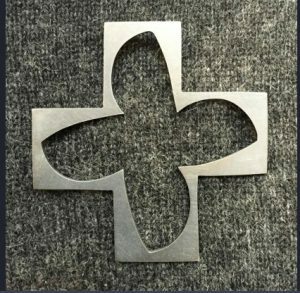 Any area where thread will rub against metal will quickly effect the integrity of the piece – the metal will wear away the thread very quickly. So, crimping a bit of silk beading thread together at the end of a finding just doesn’t cut it. Try using gimp to protect any areas where metal may rub against thread. Glue – this can discolour and look ugly. Knotting – ensure that the piece is knotted tightly and back down the length of the neckpiece. Neckpieces can also stretch, another reason to ensure the threading has been done tightly in the first place. We recommend outsourcing your stringing to companies that specialise in this procedure. If you’re using coated steel wires and nylon threads invest in slightly better quality versions rather than fishing line and ones purchased from the local hardware shop. Beadalon beading products sold through A&E metal merchants or on the Beadalon website have great coated wires and threads, these wires last longer, and depending on the version you buy, have great flexibility, stopping them from kinking and snapping easily. 6. Earring wires – Make them straight and strong! It’s important to make sure your earring wires are straight and work hardened. 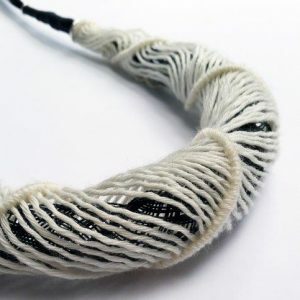 Burnish any wires after they have been soldered otherwise they can bend and flatten, just in the process of being delivered to the gallery – we are totally serious – it’s amazing what can happen!! 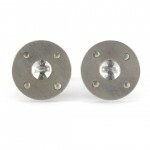 Burnishing takes a few minutes and ensures the wear ability and integrity of your work. 7. Turn up to exhibition openings – particularly if you’re in the exhibition and live in the same city! It continually surprises us when artists don’t turn up to their own shows. It’s important to support your gallery and your fellow artists by turning up to openings where possible. It also enables you to meet other artists and potential clients. Okay, I have to fess up here – I am guilty of this one. I once submitted a work to an award exhibition and was so embarrassed about the work, that I couldn’t face turning up. I ended up winning in the emerging category and wasn’t there to collect my prize! I was new to the CJ world, shy and scared of people – so I totally get it – BUT – it’s REALLY important! 8. If you want to be known, get known – this one’s for all those students and emerging CJ artists out there. To stand out from the crowd, regularly attend openings and visit galleries, introduce yourself, offer to help out as an intern, be enthusiastic! 9. Cleanliness is next to Godliness – yes, washing your hands regularly WILL keep those nasty cold bugs away, and delivering your work clean and tarnish free will make all the difference! 10. And lastly – packaging (only because the OCD side of me needed to make this 10 hints) – we love receiving parcels! One of the best, best, best things about running a gallery, is that we get to pretend it’s Christmas all the time. However, like kids, if it takes a degree and various surgical instruments to either unpack or repack the box, the shine quickly wears off. Make sure work is well padded, but don’t over do it. There’s no need to use a roll of sticky tape and 3 layers of paper and 4 sheets of bubble wrap for a single pair of earrings. Also don’t pack everything in like an extremely well thought out jigsaw, with no room to move. While at the time it might seem brilliantly clever it just makes us feel like frustrated 3 year olds when we can’t fit that last piece of jewellery back in, and spend half an hour trying to work it out….and failing…..and then we need to recover with coffee and cake! ObjectLab returns to SCA – 5-day intensive workshops to kickstart your practice! psssst….extra bonus! 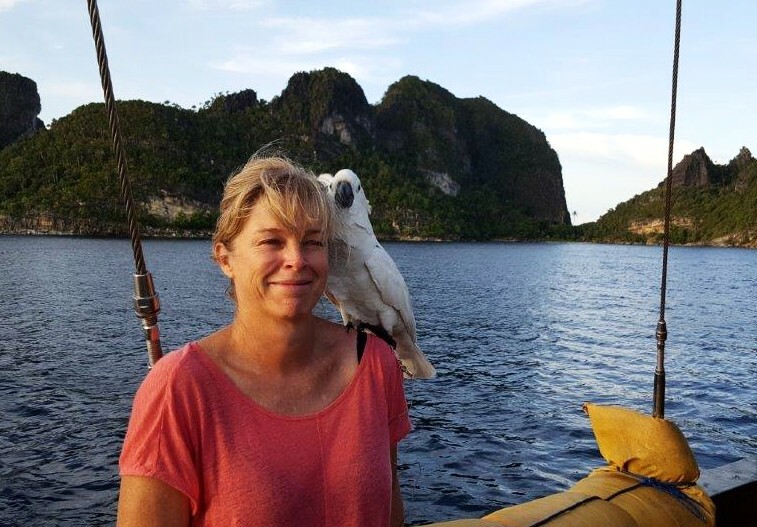 – a special student discount is available for Mel’s workshop (check out some of her great work currently at Studio 20/17) – contact Karin at karin.findeis@sydney.edu.au if you wish to participate in this special offer….tell her studio 2017 sent you….enjoy – bk. 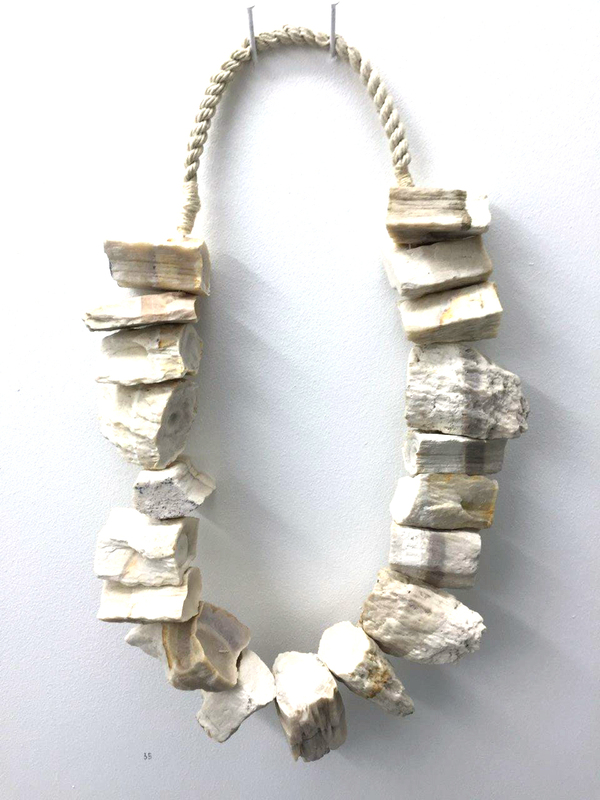 This workshop will explore and challenge approaches to making, focusing on the theme ‘Unnatural Jewellery’. Participants will be encouraged to experiment with and deconstruct a variety of found materials whilst developing and working to a theme. Challenge their ‘natural’ and collaborative approaches to making. Experience new approaches to working with experimental materials and colours. Consider and develop a conceptual approach to materials to guide the making process. Develop a collection of experimental pieces of jewellery using deconstructed materials and new techniques, which are then developed into a small body of finished work. Level: All Levels. This workshop is suitable for beginners through to experienced artists. Do you have a photograph you would like to transfer onto a ceramic artwork? Would you like to learn how to make your own Japanese-style tissue paper transfer? This workshop is a great opportunity to learn new image-making techniques designed for artists working with clay. During this hands-on workshop participants will learn how to make their own silk-screens, transfer photographs and drawings onto raw clay and bisque ware, make laser toner decals, Japanese tissue paper and photocopier transfers, and mix their own inexpensive printing inks. All the techniques demonstrated in this workshop are easily transferrable to participants’ own studio or home. During the workshop, participants will hand build simple forms which will be bisque fired during the course. We’d love to congratulate one of our gallery artists Melissa Cameron. Melissa was recently awarded the top silversmithing prize at the Buda Contemporary Silver and Metalwork Exhibition. Melissa received the Arts Centre Prize including acquisition of the work by the Arts Centre in Melbourne.